Ankle or cropped pants have been on the fashion scene for a while…seen on the cat walks by designers, worn by celebrities so it means they are a fashion must have for every woman who is fashion forward. Crop pants are stylish, simple to put together and versatile. They can be worn as official outfits, casual or for a day out for functions from weddings to graduation parties. Their length makes then seem casual making many women to almost shy away from them but you just need to know how to pull off the look. Crop pants can be worn during the hot season actually they are comfortable enough to be worn all year round in all seasons. During the hot seasons you can wear with lighter fabrics like sheer tops and chiffon blouses, pairing with flat shoes, wedges or heels. During the colder seasons you can pair with a warm cardigan and go for boots or booties because of their cut and length. 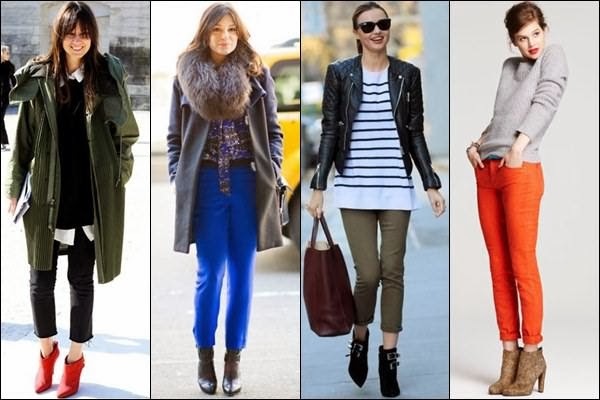 Want a laid back look; you can opt to wear slouchy pants with pieces of fabrics that are lighter in colors and material. If you are trying to wear the ankle/ crop pants for formal occasions pick darker shades for the office and they can be paired with an official jacket and heels. When the weather is hot add a dash of color for a bright look. Always consider your height when putting on crop pants. Due to their cut and length tall women are much more comfortable with wearing the crop pants, for the short women you can wear them with high heel so that they give you height to avoid looking stumpy and odd. When it comes to shoes heels are the best options for wearing crop pants…they elongate your legs making you look sexier in them. Flat shoes like sandals, brogues, thong sandals also work well giving you a casual look.